Brig. Gen. Christian Funk, a 1985 graduate of the U.S. Air Force Academy, chats with Troy Calhoun, head coach of the Air Force Falcons football team. ROBINS AIR FORCE BASE, Ga. — Brig. Gen. Christian Funk has come a long way since his days as a standout defensive end on the Air Force Academy football team in the early 1980s. From fighter pilot to wing commander to his current assignment as the deputy director of strategy, concepts and assessments for the deputy chief of staff for strategic plans and requirements, Headquarters U.S. Air Force, at the Pentagon, Funk has navigated a very successful Air Force career. Whenever he has the opportunity, he likes to navigate his way back to his alma mater to show his support for the Academy football team and all of the Academy’s cadets. Late in the 2018 football season, Funk was back on the field with his beloved Falcon football team. This night, he was the honorary captain during the coin toss at the University of Nevada Las Vegas, where he would be honored for his time as a member of the AFA team and his Air Force career. 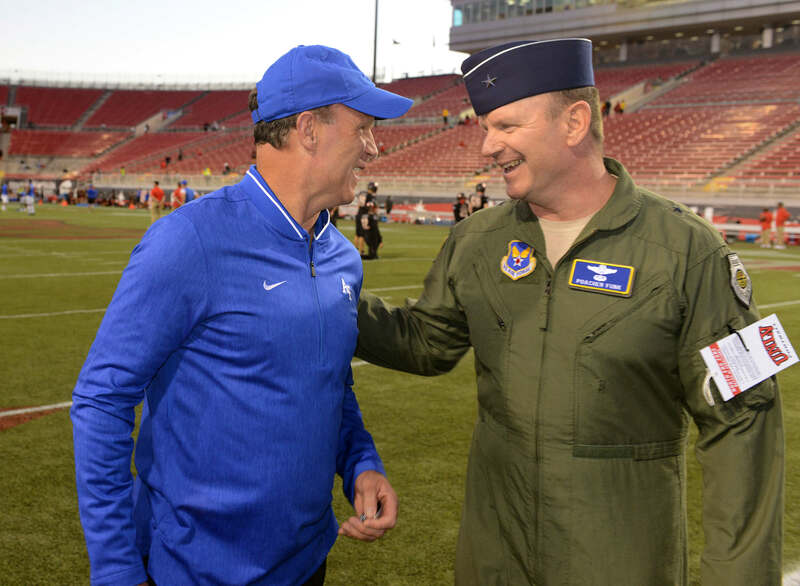 The general watched the first half from the AFA sideline and it was obvious being close to his former team brought out his competitive juices. He even went behind the bench when the defense was being gashed early in the game, listening to the coaches and players discuss what took place on a UNLV touchdown drive. Although Funk’s military career has taken him all around the world, he still stays close to the academic institution and football team where it all started for him. Being a student-athlete at the Air Force Academy helped shape the Air Force officer and leader Funk has become. Growing up in Fayetteville, North Carolina, Funk attended Pine Forest High School, where he was coached by Gary Weller. He said he was recruited by the service academics and a few east coast teams to play football. Funk decided to attend the Air Force Academy, like his older brother. He became a four-year letterman and was the Western Athletic Conference Co-Defensive Player of the Year his senior season in 1984. He also garnered AFA Male Athlete of the Year honors in 1985. He finished his career with 248 tackles, 22 tackles for loss, three fumble recoveries, two caused fumbles and four blocked kicks. Funk spent the 1985 season as a graduate assistant at the academy under Coach Fisher DeBerry. The Falcons had their greatest season ever that year. The team finished the season 12-1, losing only to Brigham Young University. Had they beat the Cougars, they would have most likely had the opportunity to play for a national championship. The Falcons ended the season ranked fifth in the nation after beating the University of Texas in the Bluebonnet Bowl. After that season, Funk moved on and began his military career. But he has never lost contact with the football program. In addition to supporting the Academy, Funk is also an avid supporter of Air Force Reserve Command Recruiting Service. While he was the installation commander at Homestead, Funk was honored by AFRC Recruiting Service as the Wing Commander of the Year, given to the commander who does the most to support recruiting efforts. While Funk has supported recruiting efforts as a commander, he has also done some recruiting at home. Using the Get One Now peer referral program, the general referred his son, Hugh, to join the Reserve. The peer referral program allows Reservists and civilian employees to refer a family member or friend to join the Reserve. Once a referral is deemed a qualified lead, the person submitting the lead is eligible for a host of awards. The general had the honor of presiding at his son’s enlistment. Now Senior Airman Funk is part of the USAFA jump team, Wings of Blue, assigned to the 70th Flying Training Squadron in Colorado Springs. He’s an instructor and evaluator in many skydiving disciplines. One thing the general, his father and his son have in common is the love of skydiving. The general’s father flew the Army’s Golden Knights as a UH-1 pilot and was a jumper as well. Now, the general and his son continue the family tradition. Funk said one of his mentors, retired Army Sergeant Major Alcee Richardson, a former Golden Knight, later became a mentor to his son. “He always imparted his experience and wisdom to Hugh and is a big part of his life,” Funk said. “It was heartwarming to see a guy who influenced my life also influencing my son’s life. Alcee, my dad and I were on the drop zone for Hugh’s first jump and they pinned his first set of jump wings on him. It was a very proud moment. As the general reflected back on his career, he realized he’s been very blessed. He said having a strong family support system has been critical to his success. For more information on the Get1Now peer referral program, go to https://www/get1now.us/ or download the app.